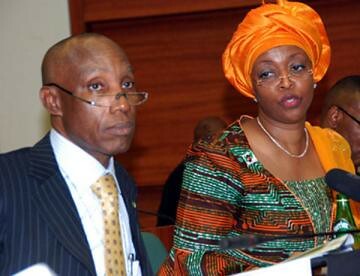 BREAKING: Jonathan fires NNPC execs, appoints successors - kaycee Weezy! In what he described as an attempt to “further strengthen the ongoing reforms and transformation of Nigeria’s Petroleum sector, and in furtherance of efforts to achieve greater transparency and accountability in government”, President Goodluck Jonathan on Tuesday night sacked the Austin Oniwon led executive management team of the Nigerian National Petroleum Corporation (NNPC). The President, in a statement signed by Reuben Abati, announced a new executive management team for the oil corporation which has been in the news of recent over different allegations of corrupt practices. The incumbent Group Managing Director, Engr Austen Oniwon, and Mr. Michael Arokodare (outgoing Group Executive Director (Finance and Accounts), Mr. Philip Chukwu, outgoing Group Executive Director (Refineries & Petrochemicals), and Engr. Billy Agha, outgoing Group Executive Director (Engineering & Technology) are to proceed on retirement. As contained in the statement, the new Group Managing Director of NNPC is Engr. Andrew Yakubu. Other members of the new management team include: Mr. Bernard O.N. Otti who is the new Group Executive Director (Finance and Accounts), Engr. Abiye Membere- Group Executive Director (Exploration and Production) Dr. Peter S. Nmadu – Group Executive Director (Corporate Services), Engr. Anthony Ogbuigwe – Group Executive Director (Refineries & Petrochemicals), Dr. Attahir B. Yusuf – Group Executive Director (Commercial & Investments) and Dr. David Ige – Group Executive Director (Gas & Power). The new Group Managing Director, Engr. Andrew Yakubu graduated from the Ahmadu Bello University, Zaria in 1979 with a degree in Chemical Engineering. He joined the NNPC in 1980. Positions he has held in the corporation include Managing Director of the Warri Refining and Petrochemicals Company and Group Executive Director (Exploration and Production). Engr. Yakubu is an indigene of Kaduna State and a Fellow of the Nigerian Society of Engineers. President Jonathan has also approved the appointment of Engr. Victor Briggs as the new Managing Director of the Nigerian Petroleum Development Company (NPDC).President Jonathan commends the outgoing directors for their service to the nation and urges the new management team to be fully committed to rapidly implementing the critical interventions needed to positively transform Nigeria’s petroleum industry. Comes too late. These people should've been sacked a long time ago, even before the probe. Its a start though. Good riddance to bad rubbish. Won't bring all the stolen money back anyway.